As always, the team behind Korean's big budget mutants-on-the-rampage feature, Sector 7, are keeping the monsters under pretty tight wraps. So no monsters yet - but thanks to 24FPS, we do have the first stills for Kim Ji-hoonâ€™s 3D sci-fi actioner. 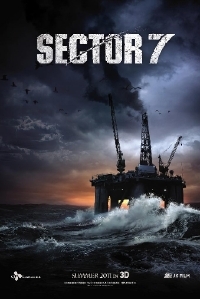 Sector 7 is about the crew of a deep sea oil rig who find themselves fighting off something mutated, angry and and very hungry. Did they awaken the kraken with their greedy drilling? I'm guessing so. Take a gander at the film's first stills after the break. My money is on Manatees. In Korea women are running with harpoons on oil rigs. Guy: "I want to talk about that guy in sector 7"
Sounds similar to 'The Host,' but on an oil rig? Definitely in if that&acirc;&euro;&trade;s the case!